America's Cup - Official site. AMNAV Maritime Services - A leader in ship-assist, tanker and barge escorts, marine construction support, salvage, emergency response, military operations, shipyard vessel assist, logistics for oversized equipment, and vessel and barge towing services. Baykeeper - Committed to protecting and restoring the water quality of the San Francisco Bay through regulatory advocacy, targeted policy campaigns and direct enforcement of California's clean water laws. The watershed includes virtually all of the state's remaining coastal wetlands and provides rare and fragile habitat for marine mammals, millions of migrating birds, and California's few remaining endangered salmon runs. Baysail - Bay Cam, sailing discussions, news, weather, online sailing course, Rules of the Road quiz (over 400 questions), extensive resources and links. Blue and Gold Fleet - The Bay Area's provider of Bay Cruise, Ferry Service and Motorcoach Tours. Located at Pier 39 in San Francisco. Board of Pilot Commissioners for the Bays of San Francisco, San Pablo and Suisun - Established in 1850 to provide California State oversight for the San Francisco Bar Pilots. The Board's duties include training, incident investigation and rate determination. BoatingSF - San Francisco Bay's premier resource for boating information. Whether you have your own boat, are looking to rent or charter one, or just want to take a cruise, BoatingSF.com has the information you need. California Department of Fish and Game - Maintains native fish, wildlife, plant species and natural communities for their intrinsic and ecological value and their benefits to people. This includes habitat protection and maintenance in a sufficient amount and quality to ensure the survival of all species and natural communities. The department is also responsible for the diversified use of fish and wildlife including recreational, commercial, scientific and educational uses. CeNCOOS Current Conditions - The Coastal Ocean Currents Monitoring Program (COCMP) is creating a state-wide network of instruments to monitor coastal surface currents in real time and provide current forecasting capabilities. CeNCOOS is one of eleven geographically distinct members of the Nation Federation of Regional Associations that comprise the coastal ocean component of IOOS. The geographic extent of CeNCOOS includes from Point Conception north to the California-Oregon border and from the coastline out to 200 nautical miles (the seaward extent of the Exclusive Economic Zone). CeNCOOS includes bays and estuaries in this region. Coastal Ocean Currents Monitoring Program: Northern California (COCMP-NC) - Funded through the California Coast Conservancy. Develops and deploys systems and infrastructure necessary for real-time monitoring of surface currents in California coastal waters. COCMP-NC will make these data available to the public, and enrich existing oceanographic monitoring programs. Commercial Fisherman of America - Promotes the common interest of the fishing industry, provide a forum to foster professional collaboration among fishermen, and educate Americans about the profession of commercial fishing. Located in San Francisco. Cordell Bank - National Marine Sanctuary about 52 miles (45 nautical miles) northwest of the Golden Gate Bridge, at the edge of the continental shelf. Friends of the San Francisco Maritime Museum Library - A non-profit California corporation formally cooperating with the National Park Service to advance the J. Porter Shaw Library at the San Francisco Maritime National Historical Park. Gulf of the Farallones - National Marine Sanctuary. A large expanse of Pacific Ocean along with nearshore tidal flats, rocky intertidal areas, wetlands, subtidal reefs, and coastal beaches located north and west of San Francisco, California. Hornblower Cruises and Events - From its beginnings in 1980 as a two-ship operation in San Francisco Bay, Hornblower has grown to a $30 million business with 29 yachts, and is the market leader in each of the six California ports it serves. Hydrographic Survey - U.S. Army Corps of Engineering soundings. Latitude 38 - Magazine covering the Bay Area boating scene. Marine and Sailing Weather Links - Forecasts, tides, waves, currents, winds, barometers, satellite and radar images, Bay Cams. Maritime Law Journal (University of San Francisco School of Law) - A biannual law journal accompanied by an annual survey of Ninth Circuit cases pertaining to maritime law. The Journal is specifically designed as a practical guide where practitioners can gain information on the latest developments in maritime law. Modern Sailing Academy Sausalito Sailing Club - Membership entitles you to use of the boats at member rates as well as discounts on seminars and events and sailing classes. Monterey Bay National Marine Sanctuary (MBNMS) - National Marine Sanctuary. A federally protected marine area offshore of California's central coast. Stretching from Marin to Cambria, the MBNMS encompasses a shoreline length of 276 miles and 5,322 square miles of ocean. Supporting one of the world's most diverse marine ecosystems, it is home to numerous mammals, seabirds, fishes, invertebrates and plants in a remarkably productive coastal environment. National Weather Service San Francisco - Detailed 7-day forecast and current conditions. Near Real Time San Francisco Bay Wind patterns - From San Jose State University. Near-Real Time Winds and Tides at San Francisco Bay Ports - Provided by NOAA. NOAA's National Weather Service: Marine Forecasts - For San Francisco Bay Area/Monterey. Office of Spill Prevention and Response (OSPR) - Providing protection of California's natural resources by preventing, preparing for, and responding to spills of oil and other deleterious materials, and through restoring and enhancing affected resources. As both a prevention and response organization, the OSPR has the Department of Fish and Game's public trustee and custodial responsibilities for protecting, managing and restoring the State's fish, wildlife, and plants. It is one of the few State agencies in the nation that has both major pollution response authority and public trustee authority for wildlife and habitat. Oiled Wildlife Care Network (OWCN) - A statewide collective of wildlife care providers and regional facilities working with oil-affected wildlife. Pacific Maritime Association (PMA) - The principal business of the PMA is to negotiate and administer maritime labor agreements with the International Longshore and Warehouse Union (ILWU). The membership of the PMA consists of American flag operators, foreign flag operators, and stevedore and terminal companies that operate in California, Oregon, and Washington ports. The labor agreements the PMA negotiates on behalf of its members cover wages, employee benefits, and conditions of employment for longshoremen, marine clerks, and walking bosses and foremen. The Association processes weekly payrolls for shoreside workers and collects assessments on man-hours, revenue tonnage, and other units of cargo to fund employee benefits plans provided for by the ILWU-PMA labor agreements. Pegasus Project - Youth program that has taken thousands of kids onto the Bay for marine education aboard the Pegasus. Pier 39 Marina - Marina; slip rentals, guest docking, slips for sale. Port of Oakland - The Port of Oakland headquarters is located at 530 Water Street, Oakland, California 94607. The Port of Oakland occupies 19 miles of waterfront on the eastern shore of San Francisco Bay, with about 900 acres devoted to maritime activities and another 2,600 acres devoted to aviation activities. Sailing San Francisco - Resources serving the San Francisco Bay Area sailing community. San Francisco Bar Pilots - The official site of the San Francisco Bar Pilots, including a good description of the work of a Bar Pilot. Their services are essential to the flow of goods between the bay Area and the world. They move more than 8500 vessels a year, working closely with shipping agencies, tug companies and the U.S. Coast Guard to deliver cargo safely and on time. San Francisco Bay Area Yacht Clubs - Links to San Francisco yacht clubs. San Francisco Bay Maritime History - Links provided by SfBayAxis.com. San Francisco Cam - EarthCam and the South End Rowing Club bring you views of San Francisco Bay from the heart of the San Francisco Maritime National Historical Park. San Francisco Marine Exchange - A San Francisco maritime institution. Its primary efforts focus on collecting and disseminating shipping information, facilitating communication and discussion in the community, and identifying and developing improvements. The scope of Marine Exchange is broad. It ranges from forecasting, tracking, statistical analysis, operational support and communications to industry forums and collaborative programs. The site also includes information on the San Francisco Bay Harbor Safety Committee. San Francisco Maritime National Historical Park - Stand on the stern of Balclutha, face west to feel the fresh wind blowing in from the Pacific Ocean. Located in the Fisherman's Wharf neighborhood, San Francisco Maritime National Historical Park offers the sights, sounds, smells and stories of Pacific Coast maritime history. San Francisco Maritime National Park Association - The Association has played an integral role over the past four decades in the development of Victorian Park and Hyde Street Pier as historical sites. Initially a part of the California State Park system and later a unit of the Golden Gate National Recreation Area, the area became a distinct National Historical Park in 1989. San Francisco Model Yacht Club (SFMYC) - A lub devoted to the building and sailing of model yachts, both power and sail. Located in San Francisco's historic Golden Gate Park at the 36th Avenue and Fulton Street entrance. There you will find a clubhouse and lake, both of devoted to model yachting. Membership is open to anyone with an interest in model yachting and power boating. Finance and Administration Division - Responsible for management of Port operations and support services including Human Resources, Accounting, Finance, Information Systems and Business Services. Human Resources includes labor and employee relations, payroll, training programs, employee recruitment and hiring, and contract compliance. Finance includes budget development and analysis, capital planning, forecasting, financing, financial and risk analysis, and reporting. Accounting includes accounts payable, accounts receivable, general ledger, financial statements and managing outside audits. Information systems includes the Port's Information Technology equipment acquisition and maintenance, local area network, computer application development and maintenance. Business services includes purchasing, materials management, mail service, telephone system, receptionist service, administration of the Port's vehicles, and management of the Port's offices. Port Commission - The Port of San Francisco is governed by a five member Board of Commissioners, each of whom is appointed by the Mayor and subject to confirmation by the City's Board of Supervisors. Each commissioner is appointed to a four-year term. The Port Commission is responsible for the seven and one-half miles of San Francisco Waterfront adjacent to San Francisco Bay, which the Port develops, markets, leases, administers, manages, and maintains. Its jurisdiction stretches along the waterfront from Hyde Street Pier on the north to India Basin on the south. The Port's operating portfolio is composed of over 550 ground, commercial, retail, office, industrial and maritime industrial leases, including many internationally recognized landmarks such as Fisherman's Wharf, PIER 39, the Ferry Building, and AT&T Park, home of the San Francisco Giants baseball team. Maritime Division - Responsible for managing and marketing a wide array of maritime industries: cruise and cargo shipping, ship repair, commercial and sport fishing, ferry and excursion operations and other harbor services. The division promotes Port maritime facilities to potential and existing customers while ensuring compliance with federal security mandates and providing environmental stewardship. Areas of responsibility include cruise and cargo terminals, ferry terminals, shipyards and dry-docks, Fisherman's Wharf and Hyde Street Commercial fishing harbors, excursion terminals and harbor service facilities for pilots, tugboats, barges, lay berthing and other ship services. The Maritime Division manages 122 tenancies, representing 6 million square feet and approximately $11 million in annual revenue. Planning and Development Division - Responsible for developing and maintaining planning and land use policies adopted by the Port Commission, for the orderly development and management of all Port properties. These policies are contained in the Waterfront Land Use Plan and its Waterfront Design & Access Element. The Planning and Development Division also manages major Planning and Development Projects, often in partnership with private developers. Real Estate Division - Responsible for all asset management, property and lease management, marketing and leasing for the Port's commercial and industrial property along the 7.5 miles of San Francisco's waterfront properties that extends from Fisherman's Wharf to Bayview/Hunters Point. The Port has over 400 commercial and industrial tenants, representing 12.8 million square feet of occupied space and approximately $38 million in annual revenue. This does not include leases to maritime tenants managed by the Maritime Division. Real estate asset and property management duties entail lease negotiations, lease and property administration and enforcement, and asset value enhancement. San Francisco Sailing - News, Crew List, Best of the Bay, Biz Index, Flea Market, YachtFind, Links. 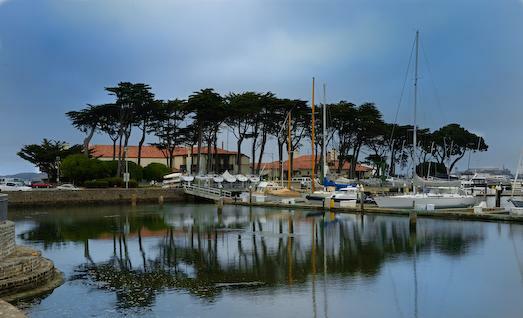 San Francisco Yacht Club - Elegant clubhouse, large harbor with individual slips, dry boat storage facility, large floating dock for small boats, full service galley, sunny deck. Home of America True, America's Cup Challenge 2000, and Olympic Trial Regatta 2000. Sea Trek Kayak and SUP - Kayaking trips and classes out of Sausalito. South End Rowing Club - Oldest of the Bay Area clubs founded solely for the purpose of rowing. SS Jeremiah O'Brien - A lovingly restored Liberty Ship that has graced San Francisco Bay for many years. St. Francis Yacht Club - A private sailing club located in San Francisco. It was founded in 1927 when the members of the San Francisco Yacht Club (the oldest sailing club in the western United States) decided to move their clubhouse out of San Francisco to Belvedere, California, about 13 miles to the north in Marin County. About half of the membership of the San Francisco Yacht Club declined to make the move and instead formed the St. Francis. It is generally considered the most prestigious yacht club in the western United States. Membership in the club is by invitation only. Sunsail San Francisco - Sunsail has opened a U.S. base in San Francisco, California. A fleet of Sunsail First 40's is available for corporate meetings and events; hopitality and networking programs; major events and local regattas; ASA Certified Sailing School Courses; youth sailing events; bareboat sailing and skippered yacht charters. U.S. Army Corps of Engineers: San Francisco District - Projects include: design, engineering, environmental work, contracting, permitting and project and construction management. Types of projects currently underway include pier construction, dredging and storm water discharge permitting for the U.S. Coast Guard and Maritime Administration. Vessel Traffic Service: San Francisco - Monitors vessels movements, informing mariners of other vessels and potential hazards, recommending courses of action when it sees a situation that the mariner may not have seen, and directing the outcome of situations when necessary to prevent disasters. USS Pampanito - Visit the USS Pampanito located at Pier 45, Fisherman's Wharf. The USS Pampanito (SS-383) is a World War II Balao class Fleet submarine museum and memorial that is open for visitors daily at San Francisco's Fisherman's Wharf. Pampanito made six patrols in the Pacific during World War II during which she sank six Japanese ships and damaged four others. Western Fishboat Owners Association - A non-profit association representing about 400 albacore tuna troll-vessel owners based in California, Oregon, Washington, Alaska, Hawaii, New Zealand, and British Columbia. These family-owned boats fish for albacore tuna during summer and fall, and some fish the South Pacific from January through April. This webpage last updated on Wednesday, January 6, 2016 6:35 PM.